Playmaker knee brace - Recommended for non-contact sports & activities of daily living; Supportive for mild to moderate ligament instabilities. The Donjoy Playmaker Knee Brace provides support and protection for mild to moderate ACL, MCL, PCL, LCL ligament injuries and hyperextension instabilities. The Playmaker incorporates DonJoy’s Four-Points-of-Leverage design to reduce ACL instability which makes it an ideal intermediate level brace for non-contact sports or full activity. The Playmaker knee brace features polycentric hinges for support and neoprene material for warmth, comfort, and compression. The brace allows for full movement at the knee and provides the protection needed so athletes can continue to participate in their favorite sport. It's available in a sleeve version with or without a Pop cutout to reduce pinching/bunching. Warm and compressive Neoprene fabric construction. Sleeve style for optimal fit. Popliteal cutout for improved fit and comfort. Versatile strapping allows ACL, PCL, or Combined Instability (CI) configuration. Polycentric hinges with contoured condyle shells mimic the knee joint's natural motion. Standard Pull-up Sleeve - (11-0860-x) No Pop Cutout; the material is left in behind the knee. 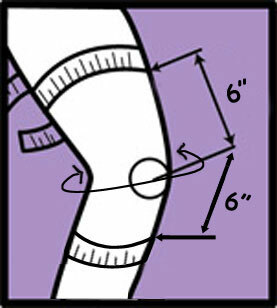 Pull-up Sleeve with Popliteal Cutout - (11-0861-x) Has oval popliteal cutout behind the knee to reduce bunching& pinching. Pull-up Sleeve with Patella Donut - (11-0862-x) Pull-up sleeve with a donut buttress for patella control. Pull-up Sleeve w/ Popliteal Cutout & Patella Donut - (11-0863-x) Includes popliteal cutout in the back of the knee with patella donut for patellar control. Mild to moderate Anterior Cruciate Ligament (ACL) tears. Medial Collateral Ligament (MCL) tears. Lateral Collateral Ligament (LCL) tears. The Playmaker features the patented 4-point dynamic strapping system found on all high end Donjoy ACL knee braces. I'm 5"5" and got this brace for skiing. Unfortunately it was too long and ended up rubbing into the top of my ski boot. Too bad they don't make a shorter version because I really like the brace and thought it was going to be the best one for my injury. I have the neoprene version for football and it's great - the only thing is it does stink after you play in it lots. My mom finally washed it in the sink and was able to get most of the stank out. Otherwise it's been awesome. Very durable too. I had major knee surgery 15 years ago for ACL, meniscus, and cartilage injuries and have been using the Donjoy Playmaker now for over 5 years. This is my third brace. I'm still on me feet everyday at work because of my job and this brace has probably saved my knee so I can still put off having another surgery. I've played 3 football games with this brace and the only complaint I have is that it slides down occasionally. I just re-tightened it up and kept going. The hinges on the sides have protected my knee from hits so overall it has been awesome. I've been using this brace for skiing over the last couple of ski seasons and it has delivered ample support. It's very comfortable and the neoprene fabric is soft and warm which my knee appreciates. It fits easily underneath my ski pants and is easy to adjust. The brace helps me ski with confidence and I'm not always thinking about my knee on turns. This Playmaker has been very helpful - recommended it to two friends. I sprained my ACL and the doctors outfitted me with one of these Donjoy Playmaker knee braces. Mine had a donut in the front for my patella, but is was otherwise the same. It gave me great protection when I was jumping up and landing from spiking. Good brace.